Written by C Uday Bhaskar. This week the Indian Navy will be hosting its week-long biennial naval engagement, MILAN 2018, in Port Blair, commencing on March 6th. Over 16 navies from across the Indo-Pacific oceanic continuum will meet to engage in this important demonstration of maritime camaraderie and seamanship. The first MILAN (meaning ‘get together’ in Hindi) was held in 1995, and emerged from a consensus that the Indian Ocean Region (IOR), with its disparate nations – big and small – could be envisioned as a community with a common objective; this being the common security and stability of the extended regional maritime domain. One recalls the concept of an Indian Ocean ‘panchayat’ being mooted by the Indian Navy in the early 1990s at an international conference held in Delhi. This laterly took the shape of the first ‘MILAN’ in 1995, where four regional navies were hosted by India in Port Blair, the capital of the strategic Andaman and Nicobar Islands which cover approaches to the Malacca Strait. As former Prime Minister Manmohan Singh had once noted in a pithy manner – the world wants India to emerge and grow stronger.This merits a contrast with the anxiety triggered by the rise of an assertive China which is palpable across South East Asia. Over the years, ‘MILAN’ has acquired a distinctive profile, in that it brings together a wide swathe from across the maritime arc encompassing Asia and the eastern seaboard of Africa. This culminates in a week of professional engagement, sports fixtures and deliberations at the flagship seminar that the tri-service Andaman & Nicobar Command hosts. Regional geo-politics cannot be divorced from such events and given the sequence of developments related to the Maldives over the last few months, the island nation has conveyed its inability to join ‘MILAN 2018’. However, the other participating nations include Australia, Malaysia, Mauritius, Myanmar, New Zealand, Oman, Vietnam, Thailand, Tanzania, Sri Lanka, Singapore, Bangladesh, Indonesia, Kenya and Cambodia. The theme of this year’s ‘MILAN’ seminar is ‘In Pursuit of Maritime Good Order: Need for Comprehensive Information Sharing Apparatus’ and it is expected that the deliberations will distill some inputs for policy formulation towards nurturing maritime ‘good order’ and enhancing regional cooperation for combating unlawful activities at sea. The underlying subtext of the challenges posed to the prevailing consensus and the contours of maritime ‘good order’ is embodied by the recent actions of China. No other power in Asia has sought to challenge the stability of the global commons like Beijing with its provocative actions in the South and East China Seas. The post-Cold War international and strategic framework is a largely United States-led template and the last quarter century has been shaped by this orientation. This is now being contested by an authoritarian Beijing, which in turn is being met by a turbulent, petulant and heavily inconsistent Trump administration. The result of which is contributing to the dismay and disarray among the liberal-democratic cluster of states in the Indo-Pacific and beyond. Against the reality of an assertive China (which this week announced an 8.1% increase in its defence budget to $175 billion USD), India is perceived as a democratic bulwark. It is however of a lesser comprehensive national capability – both economic and military- when compared to the rising power of Beijing. China has a Gross Domestic Product that is almost four times that of India and this is now heavily reflected in the military asymmetry within Sino-India relations. At $175 billion for its defence budget, China is now second only to the U.S., which allocates close to $700 billion USD for the Pentagon’s global military machine. In contrast, India’s defence budget for 2018-19 is expected to be a mere $45 billion USD. The maritime domain, with specific reference to the extended Indo-Pacific, is now the focus of a latent contest and competition. On the one side lies China and the other, a loose United States-led regional consensus, which includes Japan, South Korea, Australia and an increasingly uneasy ASEAN. It is against this backdrop that ‘MILAN’ acquires a certain specificity, where the symbolism is inversely proportional to the substantive content of the 16 navies meeting under one umbrella. As former Prime Minister Manmohan Singh had once noted in a pithy manner – the world wants India to emerge and grow stronger. This merits a contrast with the anxiety triggered by the rise of an assertive China which is palpable across South East Asia. This marked unease with Beijing is now spreading to Africa and Australasia too, where the scale of the Chinese footprint and the intensity of its penetration in various domestic sectors, including shaping the political domain in Beijing’s favour, is leading to increasing consternation. The theme of ‘MILAN 2018’ is a combination of the imperative of ensuring regional ‘good order’ at sea and the need to share information in a comprehensive manner. This is reflected in the participants which from as diverse and distant nations as Kenya, and New Zealand. MILAN will likewise see relative newcomers like Tanzania work with other navies who have been part of ‘MILAN’ for the last two decades. This mix is indicative of the politico-diplomatic comfort that a democratic India induces in within multilateral and naval affairs versus China. China and its rising comprehensive profile are part of a reality that the Indo-Pacific and the rest of the world are coming to grips with in a varying manner. It would be invalid to suggest that the response to an assertive Beijing, under an extended ‘Emperor’ Xi Jinping, must be the binary option seeing during the Cold War of creating an anti-China coalition led by the United States and the western alliance. But signalling to Beijing that other permutations and combinations (not devoid of a latent political and strategic import) are feasible, is a prudent path. MILAN 2018 could be interpreted as steering such a course, with India the consolidating force. China’s President Xi Jinping and Indian Prime Minister Narendra Modi have both exuded a certain maritime affinity in their policy formulations. Xi is associated with the ambitious and controversial Belt & Road Initiative (BRI). Whilst Modi has advocated Security and Growth for All Regionally (SAGAR) in the Indian Ocean, and also the Asia-Africa Growth Corridor with Japan as a major partner. 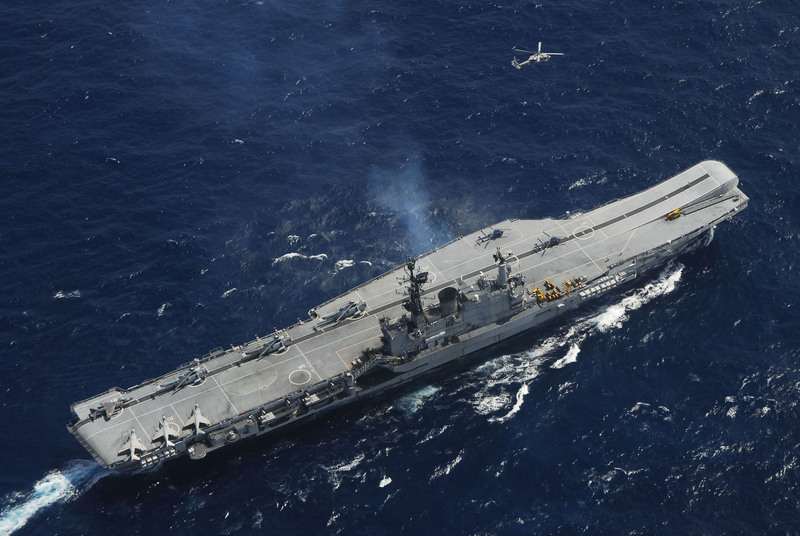 Harmonising these initiatives in a consensual and cooperative manner could lay the foundation for a less discordant Indo-Pacific community – 16 of whose members will steam away from Port Blair on 13 March at the concluding Pasex (passage exercise), till they congregate again at the next MILAN in 2020. C Uday Bhaskar is a retired Commodore in the Indian Navy and currently serves at the Director, Society for Policy Studies (SPS), New Delhi. He tweets at @theUdayB. This article was first published on the online magazine The Quint and can be found here. Image credit: CC by Wikipedia Commons.